Osage orange trees are a common sight on the Great Plains today although they were not a widespread member of the prairie community originally. Found primarily in a limited area centered on the Red River valley in southern Oklahoma and northern Texas, they were planted as living fences - or hedges - along the boundaries of farms, and have spread widely from these restricted, linear beginnings. The trees are easily recognized by their glossy, lance-shaped leaves (see illustration), and their short, stout thorns. The name of the tree comes from the Osage tribe, which lived near the home range of the tree, and the aroma of the fruit after it is ripe. (Find one of the fruit that has been sitting in the sun on a balmy Indian Summer day and notice the pleasant, orange-peel smell of the skin.) Not all of the trees will have fruit because Osage Orange are either male or female, and only the females will bear fruit. The fruit of the Osage Orange - the so-called "hedge apple" - stands out vividly in an autumn treeline. It is a large, dense, green wrinkled ball up to 6" in diameter that often persists on the tree after the leaves have fallen off. In good years, the branches will bend low with the combined weight of these heavy fruit. They have a sticky, white juice within them. Before the invention of barbed wire in the 1880's, many thousands of miles of hedge were constructed by planting young Osage Orange trees closely together in a line. The saplings were aggressively pruned to promote bushy growth. "Horse high, bull strong and hog tight." Those were the criteria for a good hedge made with Osage Orange. Tall enough that a horse would not jump it, stout enough that a bull would not push through it and woven so tightly that even a hog could not find its way through! After barbed wire made hedge fences obsolete, the trees still found use as a source of unbeatable fence posts. The wood is strong and so dense that it will neither rot nor succumb to the attacks of termites or other insects for decades. The trees also found use as an effective component of windbreaks and shelterbelts. -A papery orange-colored skin on the roots. Its strong yet limber branches were prized for the construction of bows by the Native Americans. The common name "Bodark" is an altered version of the French "bois d'arc" or "bow wood". Hunters who are interested in the use of the wood for bows can check out OsageOrange.com. Chop one in half and you will see a pithy core surrounded by up to 200 small seeds (smaller than sunflower seeds) that are much sought-after by squirrels. Try to harvest these seeds for yourself and you will get a clear understanding of how much the squirrels must like them! In addition to ripping apart the tough, stringy fruit, there is a slimy husk around each individual seed that must also be removed before the seed can be eaten. Nonetheless, Osage Orange trees are a magnet for every squirrel in the neighborhood. They typically sit on the ground at the base of the tree or on a wide branch up in the tree to disassemble their prize, making a big mess in the process. Piles of shredded hedge apple are a sure sign of squirrels in the area. The seeds are edible by people, but one must do like the squirrels and pick them out of the pulpy matrix and remove the slimy husk. This is the only part of the fruit that people can eat. Cattle are sometimes tempted to eat the fruit and may choke on them if they do not chew them up sufficiently. How Do You Grow Osage Oranges? The tree is easily grown from the seeds, but it is a challenge to separate the seeds from the fruit. One technique for separating the seeds is to drop a fruit into a bucket of water and wait until it gets a little mushy, then do the separation. Late season freezes combined with damp conditions will accomplish the same task for ones left on the ground. Plant individual seeds taken from a fully mature fruit (wait until they start falling on the ground). You can start them in pots inside, but you can have good luck growing them outside in a planting bed too - its just more difficult to transplant them when they are started in the ground. The trees will be either male or female, and only the females will produce hedge balls. The trees become sexually mature by age 10 and there is no easy way to determine the gender prior to then. The trees can grow quickly in a good location with ideal growing conditions. They make a decent shade tree within ten years. If you are wanting to grow a hedgerow, plant them no more than five feet apart and plan to thin them as they get bigger. If you are considering growing them, think twice and make sure you want to do this! The trees can spread and become a real problem in pastures. The thorny branches make pruning difficult, and the thorns can easily cause flat tires - even through the thick tread of a tractor tire. You certainly don't want to step on one barefoot! 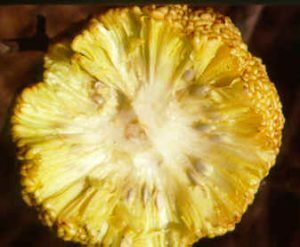 Many people believe that the fruit of the Osage Orange will keep insects out of the house. They will gather and place them around basement windows and other likely locations to discourage entry by crickets and other insects. Other people say this only works as long as the fruit is green. (Of course, by the time the fruit is dried up, there will no longer be any bugs trying to get inside!) Other people say it does not work at all. Research at Iowa State University has shown that there are chemical compounds in the fruit that repel cockroaches, although the fruit itself does not. One method that definitely works is to pick up the hedge apple and smash the offending bug with it. That is a sure thing! Many miles of hedgerows have been removed for various reasons over the last few decades. The remaining hedgerows on the Great Plains are habitat islands for those creatures that prefer the forest to the prairie. Along with the gallery forest found next to streams and rivers, hedgerows provide a place to live for many kinds of wildlife that would not otherwise be found on the prairie. In areas that have been converted to agriculture, hedgerows may be the only winter shelter available for wildlife. 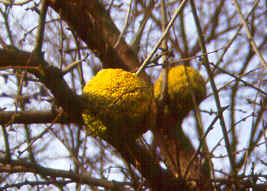 Osage Orange trees are the backbone of most of those hedgerows and are a distinctive member of the flora of the Great Plains.